Successfully Added Car Mobile DVB-T Digital TV Receiver with TV Antenna and HDMI Out (MPEG-2/4) to your Shopping Cart. You bought a super cool Car DVD player that comes with all the great features such as video/audio playback, GPS, Bluetooth, and it brought you endless hours of joy on the road. But your mighty entertainment center is not 100% perfect yet: it does not have the DVB-T function, and you miss your favorite TV shows a lot. Well, you are not alone. To make your in car entertainment flawless, we have decided to introduce this Car mobile DVB-T Digital TV Receiver with TV Antenna that decodes both MPEG-2 and MPEG-4 signal types for you. 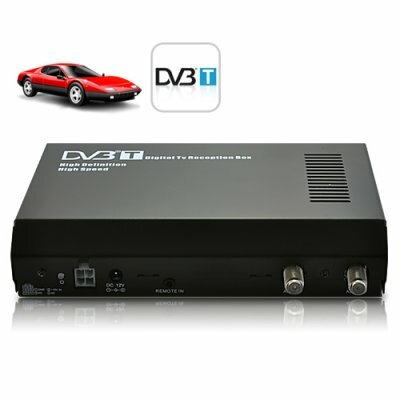 The Car mobile DVB-T Digital TV Receiver With TV Antenna (MPEG-2/4) supports virtually any type of DVB-T video standard, including MPEG-1, MPEG-2 MP@HL, MPEG-4 ASP@L5 HD:DivX(3.x-6.x), HD: H.264, HD:1080i, and supports both NTSC and PAL video system. In addition, it supports multiple audio standards, including MPEG-1, MPEG-2(layer I/II), AC-3, E-AC-3, AAC, HE-AAC level 2 ≤vel4, and MP3(AC3 copyright expenses required) for you to enjoy high quality radio programs. You can use it in any country that uses the DVB-T (other than ATSC) broadcasting system in the world. It’s easy to use. Just hook it up with your Car DVD, use the remote control to search and save your favorite TV/Radio channels, sit back and start to enjoy endless hours of high definition entertainment! With a cigarette lighter adapter and a display, you can also use it at home. This cool product is now in stock for single or bulk order. Add it to cart now and we will express ship it out tomorrow! It also comes with our famous 12 month product warranty. Brought to you by your source of China factory direct electronics – Chinavasion. This DVB-T product receives both MPEG-2 and MPEG-4 encoded signals. The USB port is not activated in this model.